Peaches and Paprika: White Cats Delight...Room for just a few more! Good morning, all. Do you have a white cat? We have room for a few more white beauties in our White Cats Delight Event on Our (Peaches & Paprika's) Facebook Page! Deadline this weekend!. PURE WHITE ONLY, PLEASE! No fair sneaking in that calico cutie, with some well hidden black & orange spots on her head.. We've discovered a few stripes sneaking in behind a beautiful white face...even a secret siamese! Other cats will have a turn later, we promise! 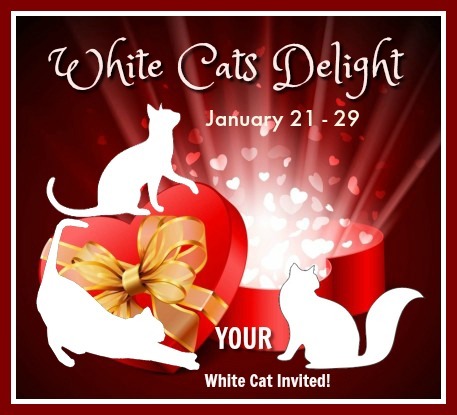 First 50 white kitties will be in our Valentines Slideshow. Worth the visit! Today we're joining Athena's CATURDAY ART and Cat On My Head's Sunday Blog Hop and invite you to visit the other gorgeous cuties this weekend! We somehow don't have a single white kitty in our family. But we sure can't wait to see all the beauties who enter! Yesl this is just a reminder for those who have white cats and haven't participated but would want to! Ellie and Allie are "mostly" white.....we hope you do a slideshow of pointed cats someday!!! No white cats here! just tuxies! Looking forward to seeing all the white kitties!